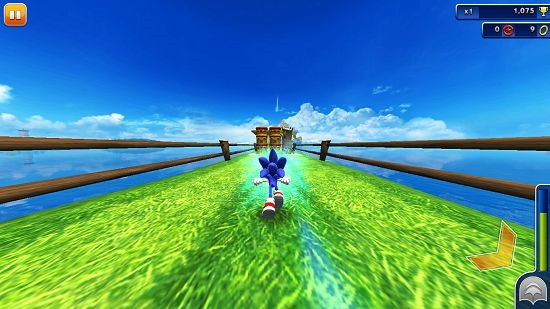 Sonic Dash is a free endless runner game app for Windows 8 and 8.1 which allows you to play as Sonic the hedgehog and run endlessly for a high score. The game is well designed all throughout, has great graphics and also has boss battles at certain checkpoints where the boss fires missiles behind and in front of you which you have to dodge by moving right or left. The game has been designed by SEGA, and hence you can be rest assured about its quality – Sonic the hedgehog character was created by SEGA! The game has various unlockable characters and powerups which can be purchased by trading in the rings which you collect during the gameplay for the same. 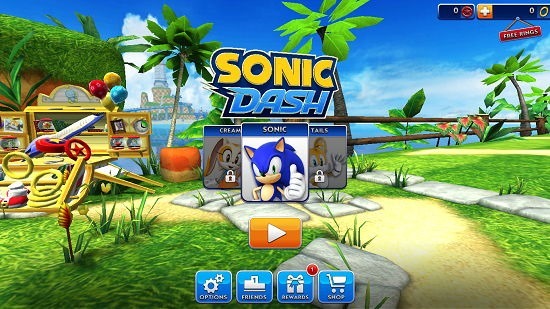 Sonic Dash is available for free from the Windows App Store. The Main Menu: When you install and run the game, you will straight off be brought to the main menu of the game. In the main menu, you can choose to tweak certain settings, choose your character and start playing the game. To start the game, click on the big Play button at the center of the screen. The Gameplay: When you click on the Play button in the main menu, be prepared to be presented with the gameplay interface. 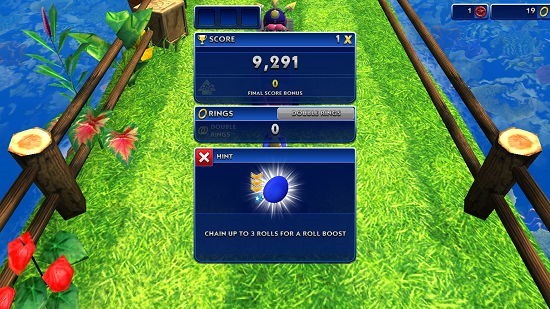 You can see Sonic dashing on the fields in the screenshot above, with all my points displayed at the top right. Left arrow button: Move left. Right arrow button: Move right. Up arrow button + Mouse click while in air: Aerial attack (useful in boss battles). You can also dash or use a speed boost when your dash meter is full by clicking on the dash button at the bottom right of the screen. The game can be paused by clicking on the pause button at the top left. The Boss Battles: To make things interesting and more challenging, the game has introduced certain boss battles which will challenge you and force you to use better strategies for gameplay. Boss battles appear when you have run a considerable distance, and these evil bosses appear out of nowhere to taunt you and try to stop you from going any further. You can see a boss pop out of nowhere on the screen above. 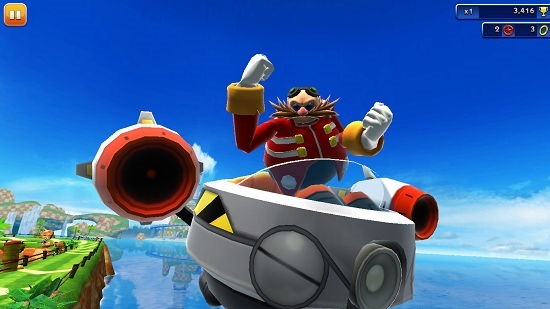 And below, you can see him attacking Sonic with his missiles. When a boss is defeated, you get a confirmation message on your screen for the same. At the end of the game, when you crash or die, you will be shown your score and stats. 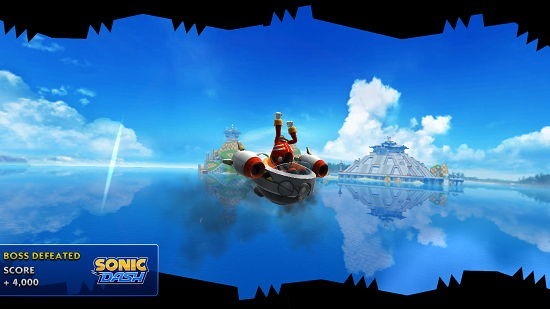 This concludes the main features of Sonic Dash. 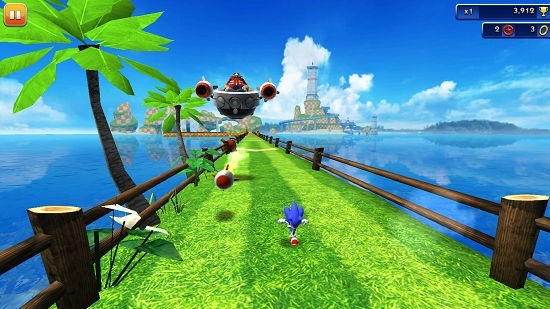 Sonic Dash is a decently designed game app for Windows 8 and 8.1 which makes for a great download on all Windows 8 and 8.1 devices. You should definitely give it a try!